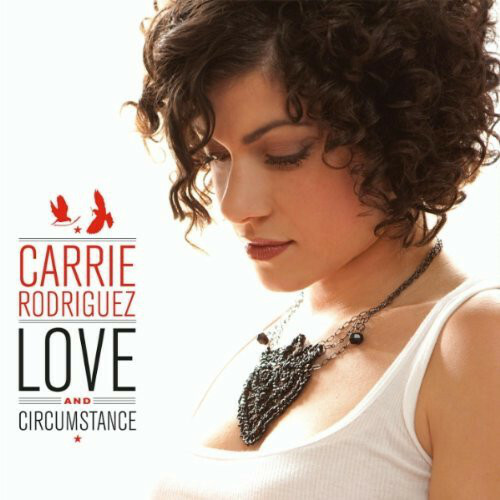 written by Julie Anne Miller & Steven P.
Carrie Rodriguez' professional career was launched in 2001 after a show at South By Southwest introduced her to Taylor, with whom she has recorded four full albums and an EP. Her musical development started much earlier, however, and at the hands of an equally seasoned songwriting veteran, her father David Rodriquez. "My dad gave me a Leonard Cohen record for my ninth birthday! I hated it. But of course I rediscovered it at thirteen and loved it." By fifteen Rodriguez and her dad were touring the Netherlands together; chops were being honed. The list of bold faced names that have come into Rodriguez' orbit over the years also includes Lee Townsend, the famed producer, who collaborated with Carrie on her 2010 release, the “beautifully conceived, passionately performed" (- All Music Guide) Love & Circumstance. She spent the following year touring primarily as a headliner and opening dates on the “Acoustic Brotherhood Tour” with Los Lonely Boys and Alejandro Escovedo and John Prine. In winter, 2011 she co-headlined the An Acoustic Café Evening Tour for the second year with Mary Gauthier, Ben Kyle, Erin McKeown, and Sara Watkins beginning February 2 and released an album of Country duets with Minneapolis based, Romantica's own Ben Kyle also on Ninth Street Opus, We Still Love Our Country. Please see Carrie's website for more info.